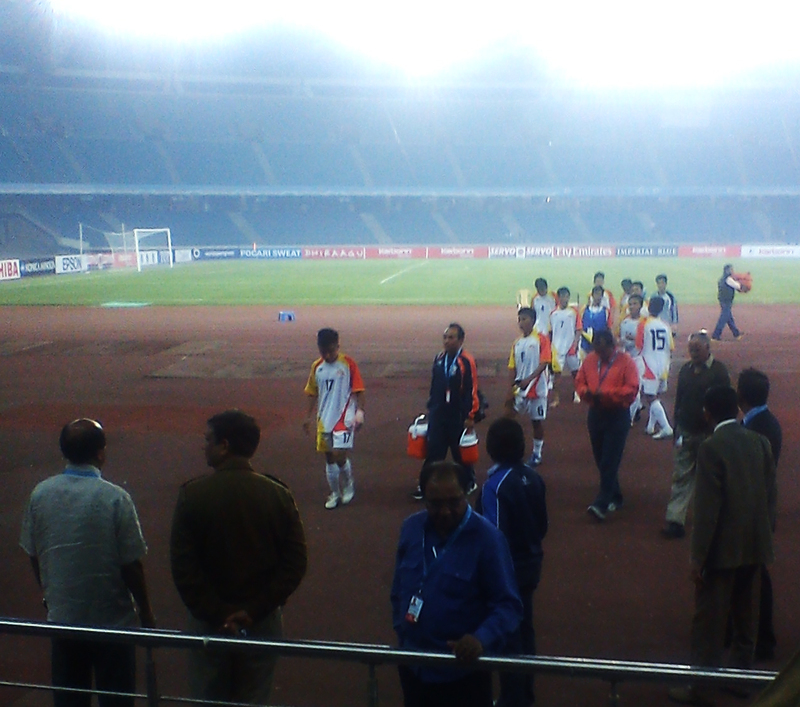 It’s been 30 minutes and the score board read Bhutan 0- India 0. This is football, bhaiya! Not the kind of game you guys are crazy of- cricket, of which India is the reigning world champions. And in football, we would definitely show you how to kick it, my mind was going crazy with overwhelmed pride, I was proud of Bhutanese footballers playing against India. India can concede more than a half dozen to other countries, of course not the ones who are playing in SAFF competition, but with Bhutan of whose football team, let alone the world, even our counterpart Indian friends doubt of having one to play against is now giving a tough time. Every dog has its own day. And it seemed like we are going to have a decent match although we don’t have hope that we will win it until we ended up conceding 5. The stadium which boasts of being second largest in the world has few hundred spectators gathered. If it was cricket, scene would have been definitely different. 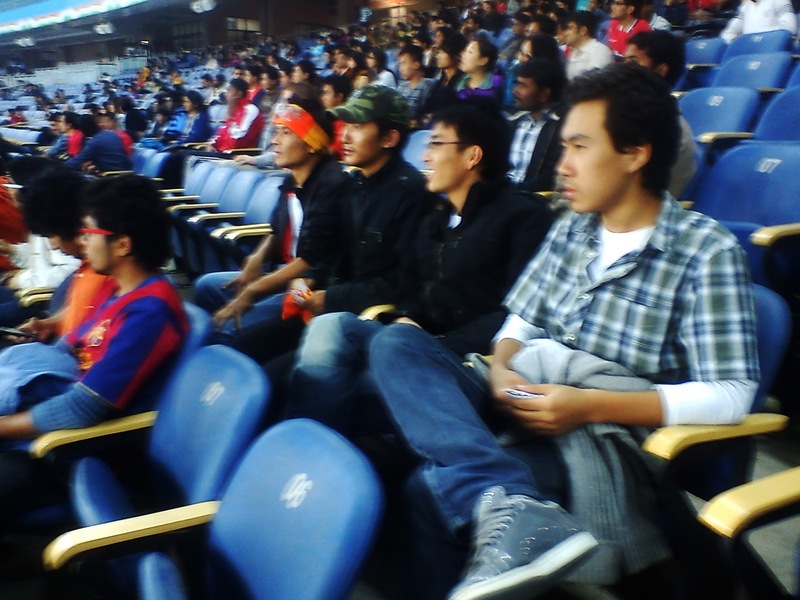 Five of us sat amongst many other Indian friends to cheer for the match. Amidst the noises and chants of ‘India’ ‘India’, five of us were as dead as our football team. Let alone the pressure from Bhutanese side, they hardly touched the ball. And we could cheer only when Bhutanese players touched the ball, and it didn’t last more than few seconds. The first goal was lucky for Indians as it came out in set piece, corner kick, but second goal, third and fourth and fifth, the tale was building up beautifully for our Indian friends who do not get much to feel delighted about their team and they have now one to feel cheerful even though most of them know only one players name- Chhetri, I doubt whether they knew who Chhetri was for it was certainly not Dhoni or Tendulkar as they shouted only Chhetri for any forward players. And amidst all these heavy heart wrenching experiences building in front of us, I looked around searching familiar faces. Of course I couldn’t guess the person but definitely gloomy and dumb faces certainly looked Bhutanese. And with game almost death, I couldn’t keep my eyes away from scoreboard and thinking that I have to sit down for few more minutes. On the day of Bhutan’s first match against Sri Lanka, I was quite disheartened with the channel Ten Action for not broadcasting the live match. It seemed insulting to show a match from I-league which was not live match also. If Ten Action sponsored to telecast the SAFF cup live on TV, then they must show all the matches. Watching live match, I didn’t mind them not showing it live though it would have been nice at least to watch Bhutan play live in TV for my own first time experience. Bhutanese players looked like a bunch of young kids asked to look for the ball and when found the ball, they were not told what to do with it. In the stylish hairstyles, our young amateurs (as often the commentator describes) lacked everything. If one was not playing the game plan, then I expected some physical play, which our young friends couldn’t do as they were too weak in front of Indian counterparts. The coach was the first person from Bhutan team to leave the field, and looking at him, I wondered whether he mistook the SAFF cup to be young kids’ championship. The goal keeper, my friend who is four years junior to me says was his two years junior in school. Of course goalie deserve every applaud. If it was not for him, we would have had enough goals for whole Bhutanese team assuming that five goals were one each for five of us. Bhutan’s famous victory over Afghanistan in 2009 SAFF looked so futuristic suddenly. Well, watching it losing without having a proper attack on opponent’s goalie who made fun by jogging along the goal line during the match as he was left without having to do anything, I wondered how long Bhutan will take to give a good competitive match. How long it will take for Bhutan to have players who can amaze us and make us feel proud? And in all those pondering, I found out that we can never be at the level to offer the competitive challenge. In the past, India might have not agreed to participate in world cup for whatever reasons unknown, we are interestingly the first country to even disagree on playing a world cup qualifying match now. We are way behind in terms of sporting education and achievements. In other parts of world, sport events brings whole broken nation together, adds country’s major part of economy through sport’s revenue, and celebrates it as a entertainment festival, we have our few Bhutanese people having a rather good time playing in a field, not even a football ground. Well, it’s a matter of time, when country’s economy grows, we could perhaps expect these facilities to also grow. As of now, let’s pass on the joke that 5-0 against India who has such sporting facilities and academies could score only five against our young team. After the match was over, it was a nice feeling though when Indian fans cheered for Bhutanese footballers as they walked out of the field. They shouted, ‘Bhutan’ ‘Bhutan’. “My team may play bad, but I am Bhutanese and I am here for them,”’ Chimi my friend echoed as he kept on wearing a headband which was painted with Bhutanese flag.